You know all those little projects that add up to time you never seem to have? 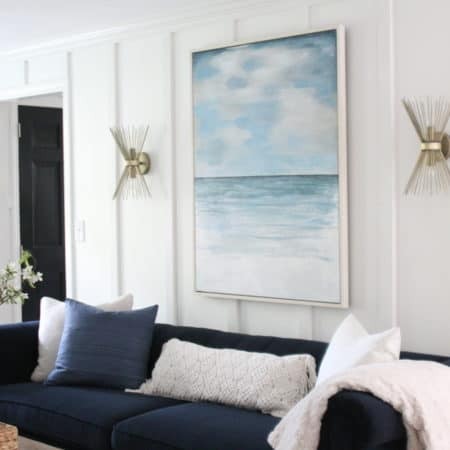 If hanging heavy or large art and/or hanging art over board and batten is on your pre-Christmas finish-up-projects-around-the-house list, then this post is for you 🙂 I finally knocked a couple items off that list! First of all, a tip from my framing days: whenever you’re hanging something fairly large or heavy on your walls, get out the old bathroom scale and weigh it. 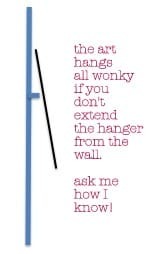 Make sure you have a picture hook or hanger that can bear the weight of your art. Large or heavy pieces are best hung from two hooks or this hanger system that I used below. 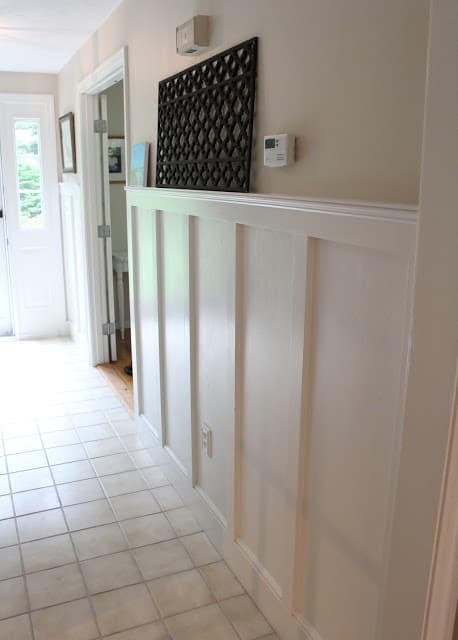 Let’s address hanging items OVER board and batten first. The large framed print I wanted to hang is actually not that heavy (13 lbs. 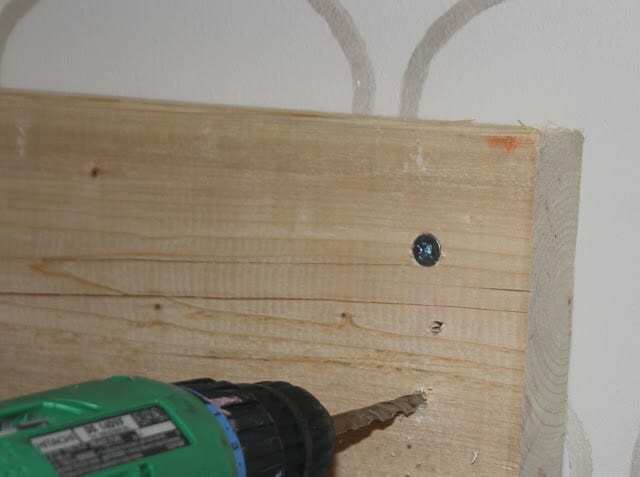 ), so to hang it, I simply used two long screws that protruded from the wall the same distance as the board and batten ledge. 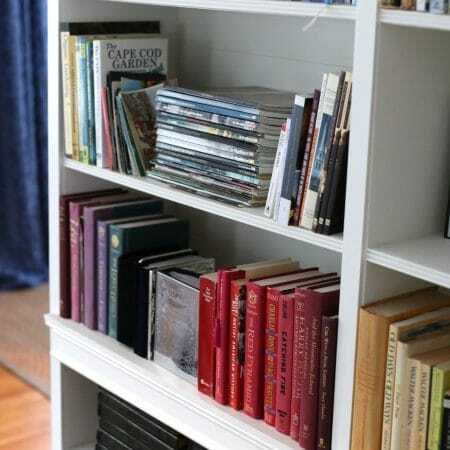 Hanging a large piece from two screws (or picture hangers) instead of one distributes the weight better. The wire on the back of the frame is hung on the screws and adjusted until level. For heavier pieces, you can install D rings on either side of the frame and hook the D-rings over the screws. Hanging this big piece of art was my solution to the dumb placement of the doorbell box and thermostat, which have been the bane of my existence. Why? WHHHHHY must they be installed smack dab in the middle of the wall? While I originally thought I would lean framed black and white photos on the ledge of this wall, it was harder than I thought to pull off with those two eyesores to contend with. Even though I couldn’t cover up the thermostat, this wall feels less cluttered with the one big print. It kind of gussies up our foyer too I think. 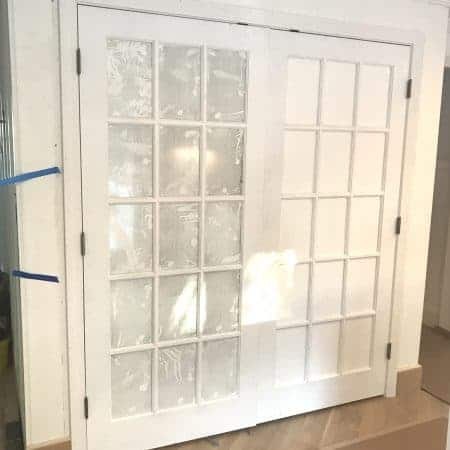 Because my mirror is really heavy, I needed more than just screws to support it, so I used a scrap board screwed into the studs to build out the wall above the board and batten…. 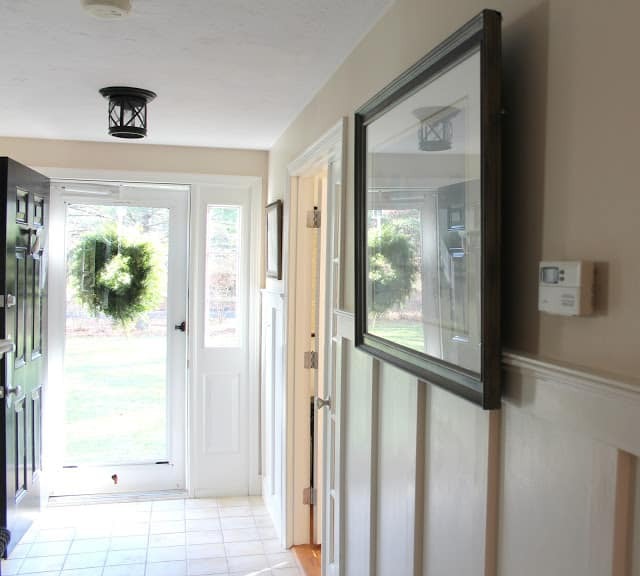 ….and then attached one of these Hangman picture hangers to both the board and the mirror. I bought the Hangman at Lowes for around $10 and think it might be the smartest invention ever!! This one can hold up to 200 lbs. and comes with a level. One half of the Hangman goes on the wall (or board screwed into the wall, in this case!)……. ….and the other half is screwed into the back of your art or mirror. The screws for the piece that goes onto the art are short, so you don’t have to worry about them coming through the front. 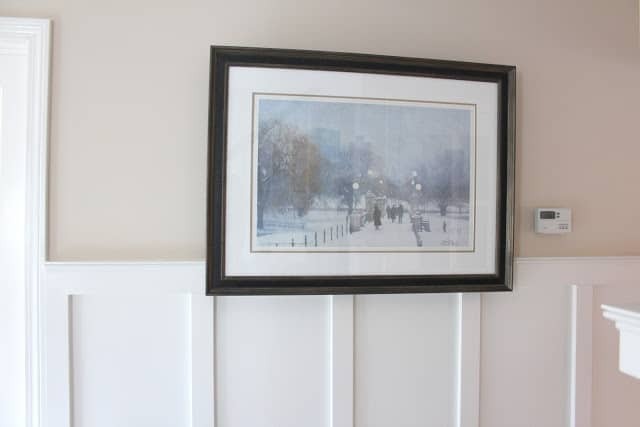 Make sure the bracket is screwed into the frame of the back of the art, and not just the backing on the piece. 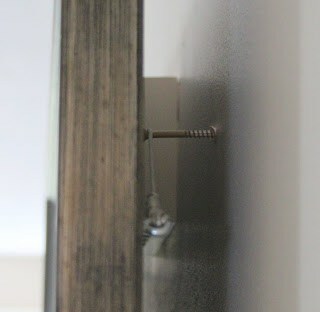 The two brackets fit together securely, and make hanging the mirror level a snap. This photo shows how the bracket attached to the mirror fits into the bracket on the board. 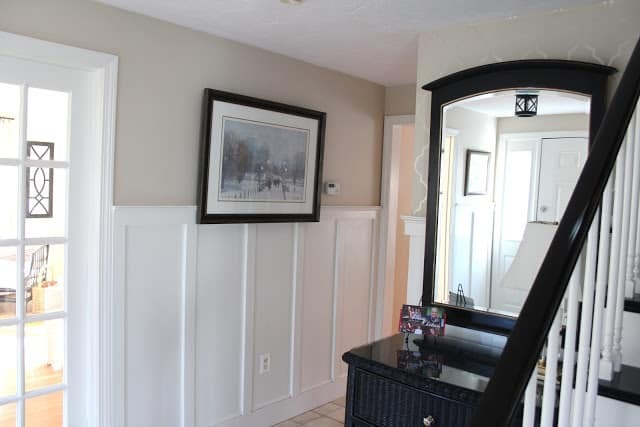 The mirror is flush with the board and batten and secure on the wall. You can’t really see the board behind the mirror, but I might throw some wall paint on the board to disguise it. Or not. 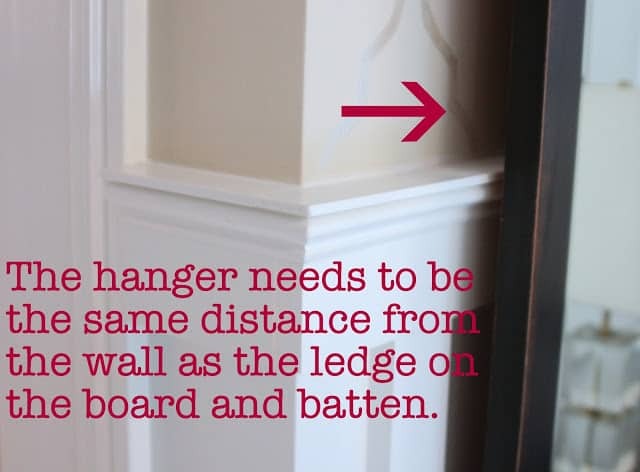 So there you have it – how to hang schtuff on your board and batten, and how to hang heavy art. A two-for-one special….THAT is how much I love you. Bam. Two items crossed off the list, 75,344 to go! 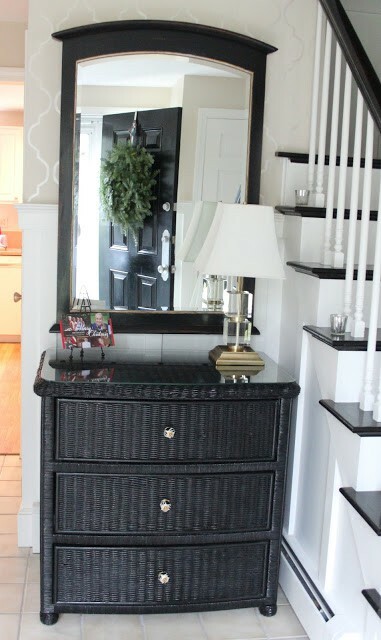 Now is this foyer crying out for some crown moulding or WHAT???? Some Fun Happenings This Week! Thank you for this! We just installed board and batten in our young teen's room and this is so helpful! that is such a smart idea! i love it! 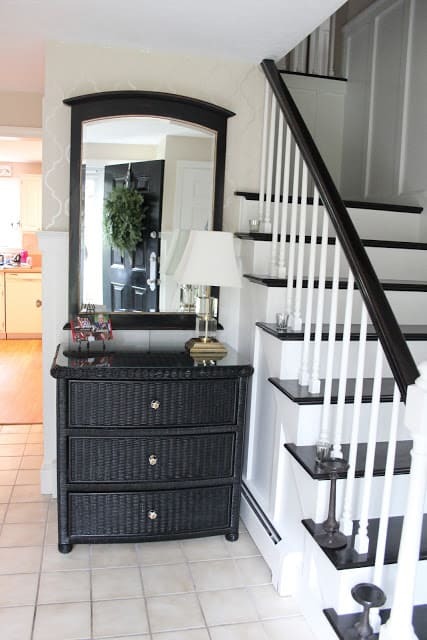 and i think i hear the foyer crying out… wait, wait, it's saying "please, just some greenery? just a little christmas tree? please christmas me!" 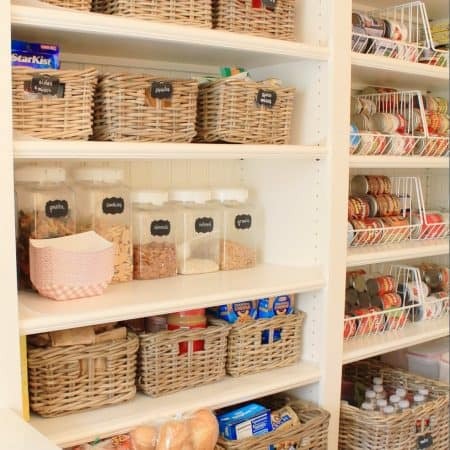 I like seeing stuff like this in other peoples' houses and wondering how they did it. Do you think they think I'm odd when I smash my face against the wall just to get a peek behind the mirror? Now I won't have to do that in yours! ha! Thanks for the insight. Great job, I have done this exactly the same way…only I didn't weigh it. I hope it doesn't fall on the dog. That thermostat can be moved rather easily. I know you have the skills for that one. Nice job. Isn't it crazy where things get installed sometimes like the door bell ringer? Ahhhhhh! So that's how it's done. Thanks for the tips. I'll be referring back to this post I'm sure! Very clever, Lisa. 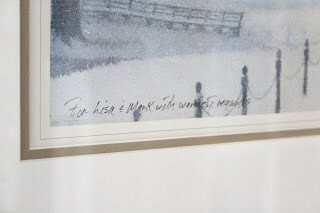 I love that print and especially since it is so special to you and your husband. 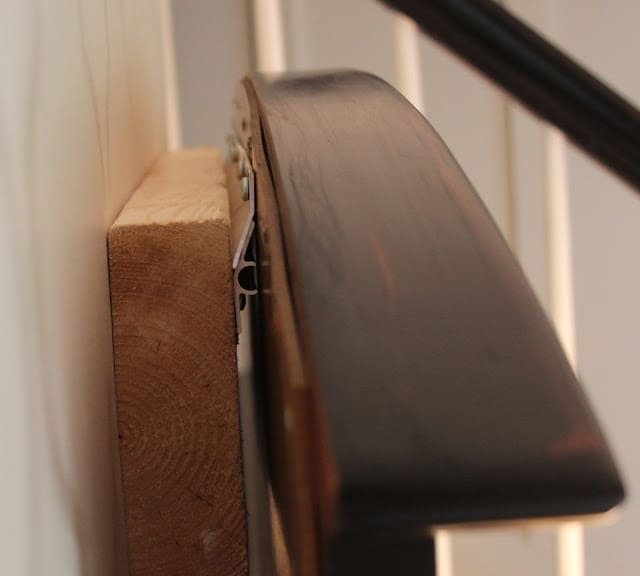 Oh I agree… contractors never put things in the right spot! 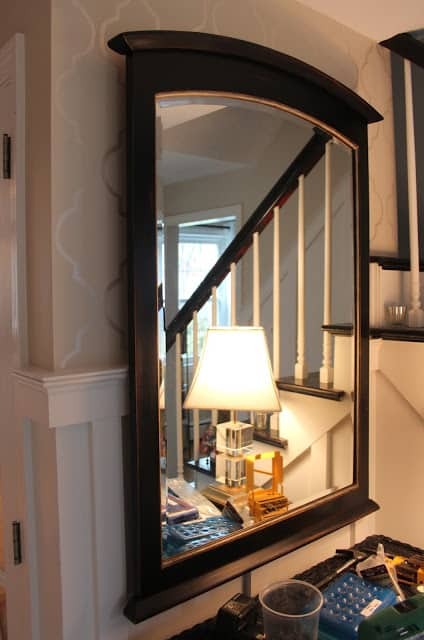 Great Ideas for having… I love the mirror in the entry!